If you are experiencing persistent pain and stiffness in the bottom of your heel or foot, you may be suffering with a condition known as Plantar Fasciitis, which is an inflammation of the plantar fascia. The plantar fascia is the thick piece of tissue or ligament that connects the heel bone to your toes. One of its main functions is to support the arch of your foot. If you strain your plantar fascia, it gets swollen and inflamed and this is what causes the pain. Plantar Fasciitis is common in people who run a lot, especially those with tight hamstrings and tight calf muscles. The calf muscles also attach to the heel bone and therefore share an attachment site with the plantar fascia. 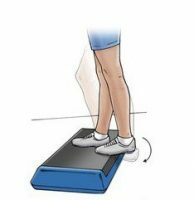 If your calf muscles are tight, this can pull on the heel bone, which subsequently pulls and strains the plantar fascia. Casual joggers can also be affected, mainly due to wearing the incorrect footwear or running in shoes without proper arch support. You may also have problems if you have an imbalance in the hips or pelvis. Correcting these imbalances will usually require a visit to a manual therapist such as an osteopath or physio, who will then give you a program of exercises that focus on improving your balance and on strengthening the pelvis and calf muscles. Our advice to help prevent plantar fasciitis in the first place is to follow this exercise regime. Be diligent and make sure to do these exercises daily. There are two stretching exercises that I find work well for patients. Stretch 1: In a sitting position place your ankle on the opposite knee. Hold onto the ball of your foot and pull it towards your shin so it feels you are stretching the bottom of your foot . Hold for 10 seconds and repeat 10 times. Do the same for the other foot. You can also massage the plantar fascia in this position using the thumb of your right hand. I find it easiest to work from the heel to the front of the foot. Stretch 2: Standing close to a wall, prop your toes against the wall, ensuring the heel and arch of your foot stay flat on the ground, so the toes stretch. Hold for 10 seconds and repeat 10 times. Do either of these exercises 2-3 times a day. Make sure to do the stretching exercises above first to warm up the fascia. Put a frozen water bottle under the arch of your foot and move back and forth on it for 5 minutes. Start with the ball under the foot and roll your foot on it. Start at the front and slowly work your way back. Put good pressure on the ball. Keep rolling back and forth making sure to massage all parts of the fascia. Do this for 5 minutes. Stand on a step or the stairs with the balls of your feet positioned on the back edge and your legs straight. Allow your heels to drop down, feeling the stretch in your calf muscle and achilles tendon. Repeat with your knees bent slightly to work the gastrocnemius and soleus muscles – the bulky muscles that you see in back of the leg. to speak to one of our highly qualified and fully insured osteopaths.